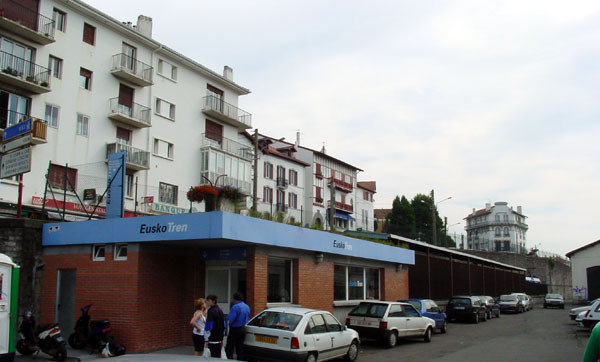 On the border of Spain at Hendaye in France in the front yard of the main-line train station is an unobtrusive brick shed marked "Euskotren", which is an abbreviation of the Basque words "Basque Train". This is Hendaye's other train station. 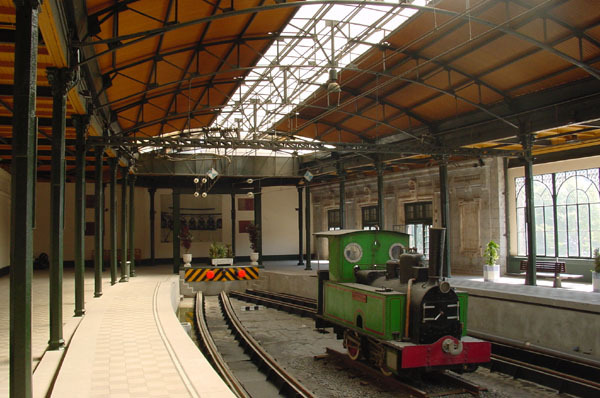 Hendaye, France; Terminus of the EuskoTren "El Topo"
Behind a simple turnstile there is a single platform, labeled "Hendaia" in Basque, and a two-car electric train that runs on 1m. narrow gauge rails. This train and its predecessors for 100 years, is known as "El Topo", the mole. It crosses the river into Spain, threads through back yards in Irún, and burrows its mole-like way through the toes of the Pyrenees mountains to the resort city of Donostia, called San Sebastián in Spanish. It is also the first link on a ribbon of 1m. 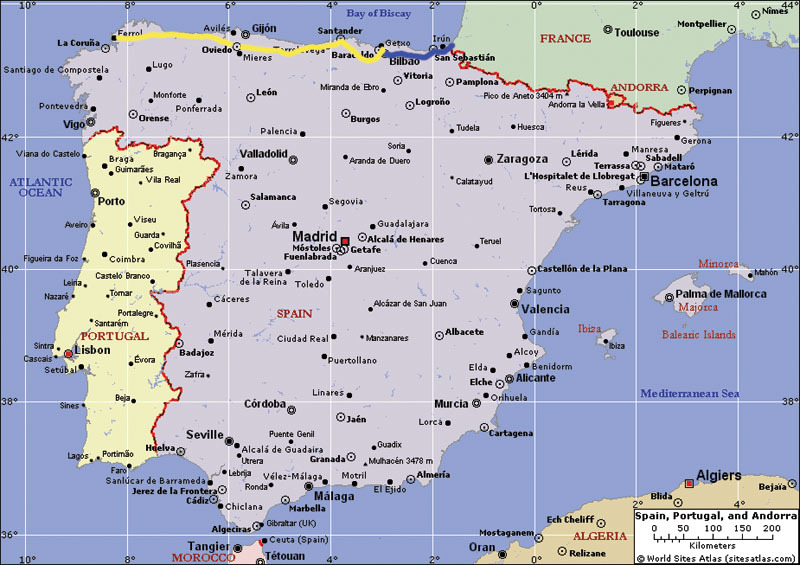 rail track through the heart of "Green Spain", linking the French border to the Atlantic coast of Spain, 800 km. to the west. 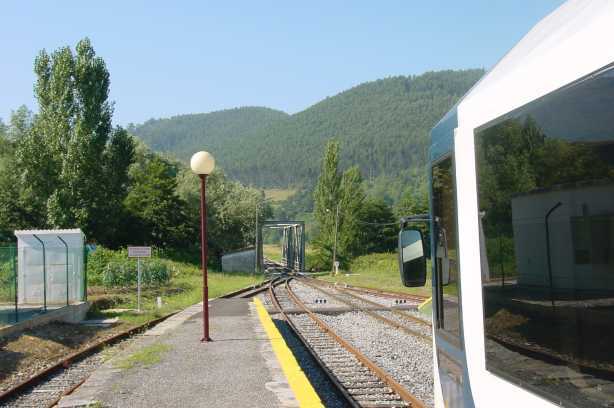 This is the narrow gauge railway line of northern Spain. 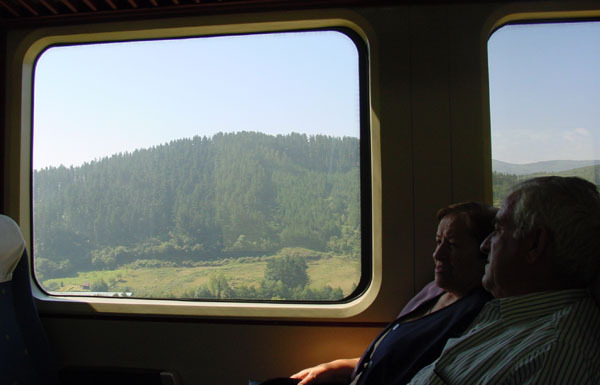 Though hardly mentioned in guidebooks, the narrow gauge line crosses all of "Green Spain", the miraculously fertile realm between Biscay's storms and the peaks of the Cordillera Cantábrica. The line touches the heart of all the region's capitals, often in stations of elegant stained glass and wrought iron and marble - in Donostia and Gernica and Bilbao in the Basque Country, in Santander in Cantabria, in Oviedo, Gijón, and Avilés in Asturias. 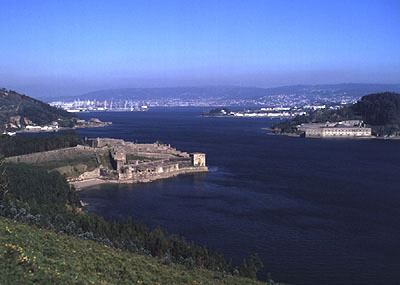 It ends in Galicia in the extreme north-west of Spain at the Atlantic port of Ferrol close to the pilgrim city of Santiago de Compostela. But it stays far away from sprawling suburbs, crowded holiday encampments, and streaming expressways; instead it threads its way through deep countryside, through meadows and valleys and wooded passes. The doors of the little trains hiss open onto the smells of grasses and byres, fields bursting with corn and peppers, an ox grazing by a STOP sign in the middle of a pasture, a tiny village with a tiled station and a hewn stone platform, an old country tavern proudly named Bar La Modernista, a market on a fishing quay, a narrow box girder bridge over a racing millstream. The journey, end to end, takes 19 hours at its fastest. But nobody need get tired of traveling - there are more than 250 scheduled stops on the through trains (more on the local trains). In many of these tiny villages you can stay the night at a casa rural, the unique Spanish country guest-house. The narrow gauge railway provides the fortunate traveler with a way to explore the heart of Green Spain, in comfort and far from crowds. Everyone on the train gets a comfortable seat near a picture window. Your companions are not stressed out tourists or harried commuters; they are chattering women on the way to a market, teenage sisters going to visit their grandmother, a herd of boys with cycles in the luggage compartment, a friar in street clothes with his robe in an athletic bag, a young couple taking their muzzled dog to the vet in the city (the conductor signals them when the station stop is long enough for a dog-walk). 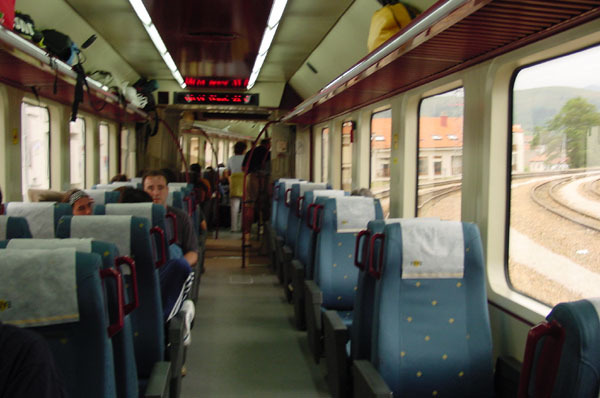 The railway was consolidated from railways built for both passengers and freight - the newest a stretch in the Galicia built in the 1960s. It is in fact two systems, as suggested by the map above. The section in the Basque Country, blue on the map above, is Euskotren, linking Hendaia / Hendaye to Bilbao, with a branches to Bermeo via Gernika. The sections to the west, yellow on the map above, through Cantabria, Asturias, and Galicia, are FEVE, "Ferrocarriles de Vía Estrecha" or "Narrow Gauge Railways". 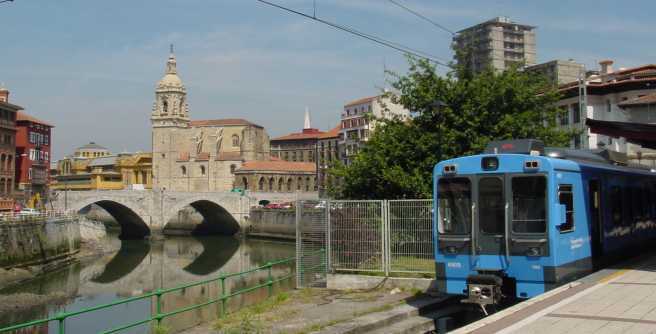 Euskotren's El Topo, the Mole, one of the shortest and most modest international expresses in the world, picks you up in France and leaves you off in the center of Donostia / San Sebastián. A change across the platform picks up Euskotren's mainline train (leaving every half hour), the Kostaldea. It runs along the coast through the fishing village of Zumaia, then heads back into the hills and enters the capital of Bilbao from the south and terminates at the Bilbao Atxuri station, small but elegant on the upper reach of the Bilbao River. 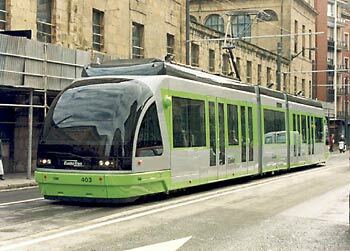 Here you can take the Euskotran, the newly rebuilt tramway of Bilbao (opened in December 2002), three stops down and across the river to Abando. 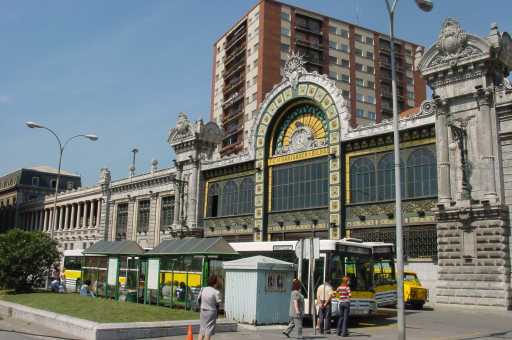 At Abando, the tram stops outside two train stations side by side - the drab mainline station and the glorious terminus of the FEVE narrow gauge, Bilbao Concordia, formerly the Ferrocarril de Santander a Bilbao, where the train loads on the upper level behind the ballroom windows. The remaining 650 km to the Atlantic coast are on the network of the FEVE. The FEVE train pulls out of Bilbao and almost immediately turns inland up a narrow valley into the mining town of Sodupe. In Sodupe it climbs higher and higher above the streets and peeks in at top windows until it breaks free into green meadows and the wooded folds of the mountains. From here the FEVE trains encounter tunnels and estuaries, tiny villages and historic cities, seaside resorts and white water rivers. The FEVE tracks are also the route of the world-renowned El Transcantábrico, among the most famous and romantic train excursions in the world, which loops from Santiago de Compostela to León (or vice versa) in eight days and seven nights of gourmet food and drink, coach trips, and sleep aboard the train. 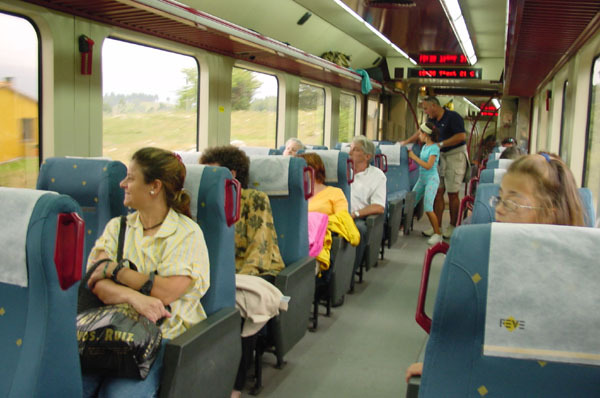 But for the adventurous traveler who wants to feel the country and the people through the skin and in the open, the regularly scheduled trains are the ticket. For a journey through the green heart of Spain, a visit to extraordinary places alongside extraordinary people, take that most ordinary of conveyances - the narrow gauge railways of Green Spain.